Happy New Year Crafty Friends, It's Larelyn from Handmade From My Heart. I get to do the final design team post for 2014 and Ann made the perfect image for me to share with you. Isn't this little Clock Strikes Midnight image adorable? I punched the image using a 2.75" punch mounted on a 3" scallop punch. I used Jaded Blossom's Wine Tag Die for my base and a stamp from JB's Happy New Year set heat embossed onto a tag from Mini Tag Dies 2. The Frap bottle is filled with kisses decorated with a 1"scallop punch holding candy stamps also from Jaded Blossom's Happy New Year set. Hard to see in the photo, but on the clock hands and gloves I used Wink of Stella brush glitter to go along with the sparkly patterned paper. For the rest of the image, I used Copic markers. This image is available in the Digi My World store now. Be sure to come back to our design team blog to meet our new designers. Beginning January 5, 2015, we'll be posting daily and there will be a brand new release on January 23 with sneak peeks beginning January 19. 2015 is going to be a great year for Digi My World. I hope you'll join us!! Wishing you and yours a wonderful New Year!!! Hello! Mel here with a new card for a new year. This cutie is in the Free section at the Digi My World Store. The sash had a different year on it but I edited that off and added 2015. To make this card, I used two dies and a sentiment from Jaded Blossom. For today's post I decided to make two cards! What would Christmas be without a plate full of cookies for Santa?!?! The digis I used on this card is called Cookies For Santa! 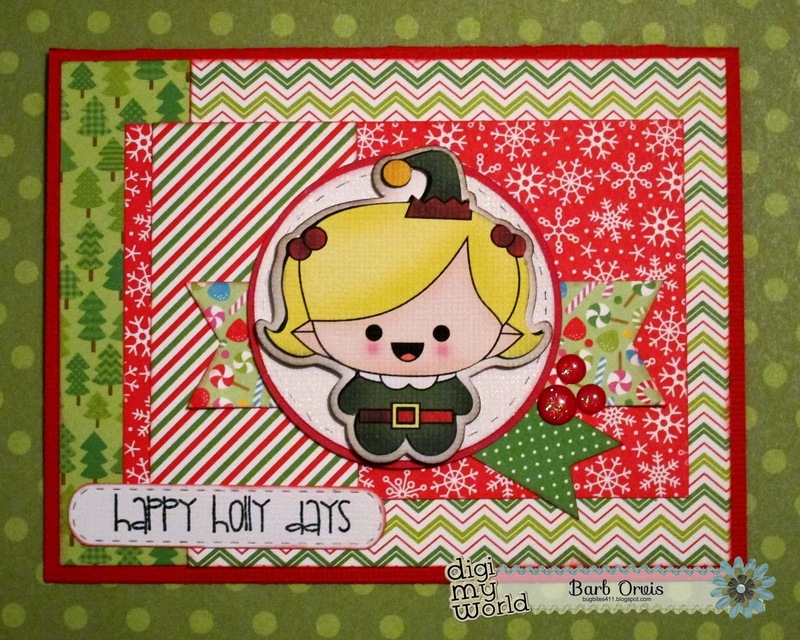 The next card I made, the digi is called, Santa's Helper Emily! Both digis can be found at the Digi My World Store! Hi, this is Sandy from A Little Piece Of Heaven! I am here to wish everyone a very Merry Christmas!!! Anyone out traveling, be safe! I won't be posting until after the new year, so... Happy New Year as well!!! If you want any information on these cards, go to my blog here! Merry Christmas, and a Happy New Year!!!!!!! Hello everyone! This is GiGi from The Cricut Bug and I am sharing some fun treat bags I made using the digital stamp from the Getting Ready set. I printed and cut the girl from the Getting Ready set using my Cameo and colored her with Copic markers. I mounted her to the Jaded Blossom Scallop Slider and Topper Die. 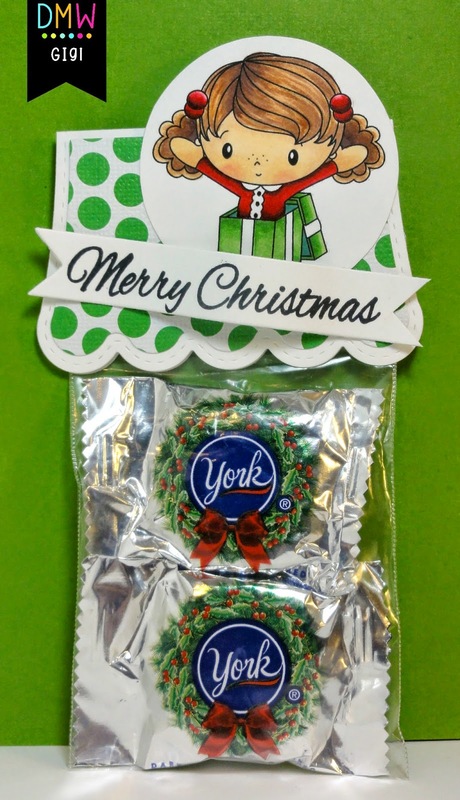 I filled a 3 X 4 inch Clear Bag with York Peppermint Patties and attached the topper to the bag. To finish, I cut the sentiment banner using the Flag Dies 2 and stamped the sentiment from the Elegant Holiday Greetings stamp set. I hope you all liked my project and thanks for visiting! Happy Thursday. Barb here with BugBites with a new Digi My World project to share. It's a winter theme card using the DMW Winter Kids Clipart file. The images in this file set are so cute and perfect for all winter and holiday cards. Once I had my card designed, I sized the clipart on the computer and printed and cut it as a circle. You can do this with your Cameo software or by using a large circle punch or perhaps a circle die. I have the old Creative Memories cutting templates that worked perfectly. you can find all the other details on my blog here. It's Larelyn from Handmade From My Heart. 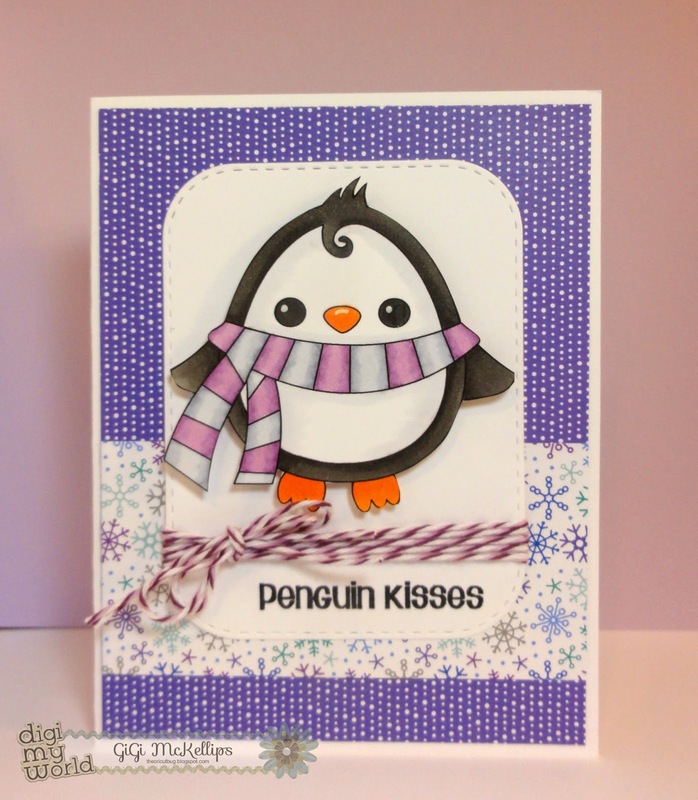 I just love the adorable Penguin Trio and decided I'd use all three for today's project. 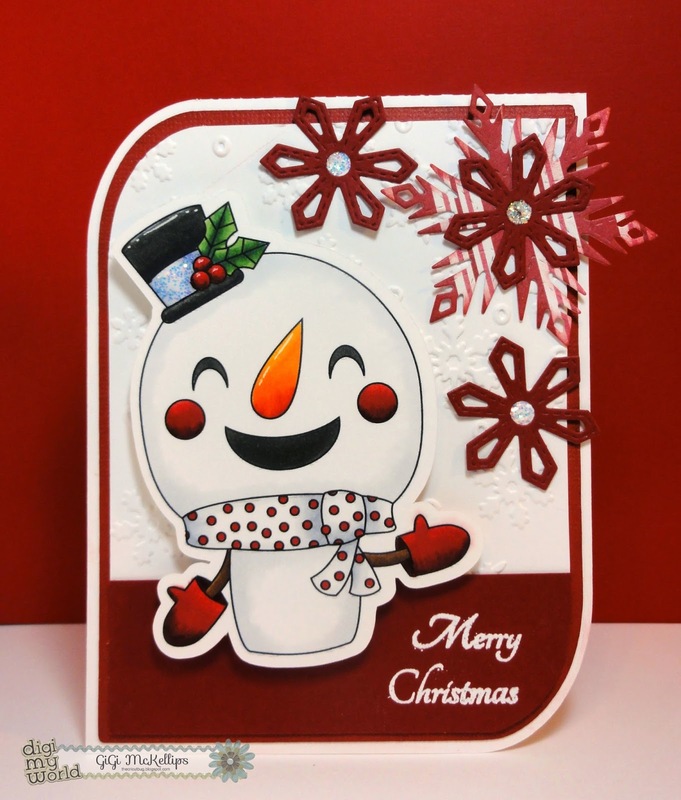 These yummy papers are from the Doodlebug Designs 6x6 Frosty Friends paper pad. I added some icicles and a snowflake using Jaded Blossom's Winter Dies. The sentiment is from DMW's Holiday Blessings clip art set. I colored the image with Copic markers and added a gem and some twine to complete the card. Hello! Melissa with some Christmas Tags to share today. I picked the "Ugly Holiday Sweaters" for these tags. I don't see them as ugly.. rather festive if you ask me. I already sent one out to my Secret Santa. The sentiment stamps and dies are from Jaded Blossom. The sweaters are colored with Copic Markers. Hi everyone, it's Sandy here from, "A Little Piece Of Heaven"! Today I am using one of the digis found at the Digi My World Store called, Winter Kids 2! Look at how many images this one has! :) They are great for making Christmas cards, and winter scenes! I have already used the little snowboarding guy this year! Hello everyone! 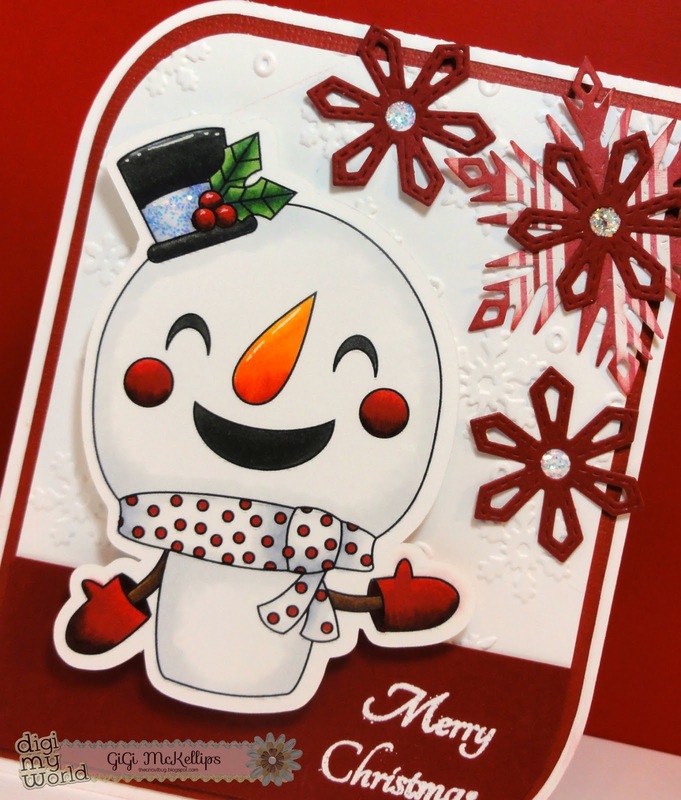 This is GiGi from The Cricut Bug and I am sharing this cute card I made using the Chibi Snowman digital stamp set. I started this project by cutting the card from SVG Cutting Files Wavy Card Base. I printed and cut out the Chibi Snowman using my Cameo and colored him with Copic markers. I also added some Stickles to his hat and white highlights with a gel pen. I embossed the background with a snowflake folder and added the snowflakes which were cut from the Jaded Blossom Winter Dies. 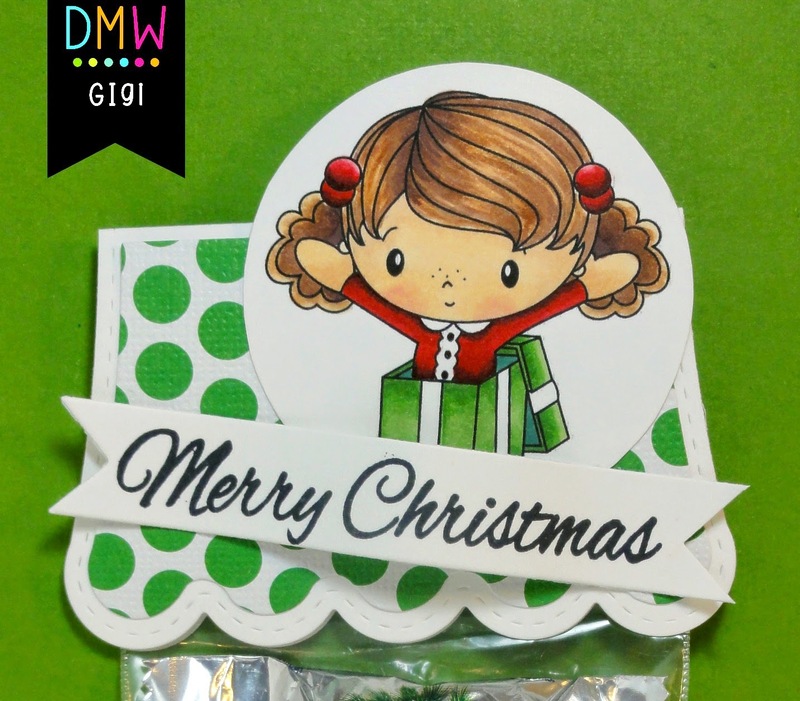 I added some Stickles to the centers and heat embossed the sentiment in white from the Christmas Candy Wraps stamp set. I hope you all liked my card and thanks for visiting! Barb from BugBites here. Hope you are all enjoying the holiday season so far. I am in holiday full decorating mode; tree up, santa collection displayed, and now working on holiday cards. The Twinkle and Sparkle Clipart is one of my favorites this time of year. I used scraps of holiday paper I had in my stash and then added my little elf with some foam tape. I did a simple print and cut. This elf set comes with two cute elf's and a sentiment that is super cute as well. How are your holiday preparations coming along? I always have grandiose ideas and then the time sneaks up on me and I find myself scrambling to complete everything on my list. At this point, I'm looking for things to help make my crafting a little easier and Digi My World CLIP ART is just the thing! These pre-colored images are so adorable and all you have to do is print them. They can be cut by hand or with your cutting machine - easy peasy. Today I made a simple card using Holiday Blessings and a cute tag using Tree Angel. Both of these are Clip Art files that can be found HERE. Just a few embellishments and you're done - couldn't be easier than that! I hope you're enjoying this special time of year. Don't forget our Design Team call. All the information can be found HERE. Good Day! Melissa here with a new card. Digi My World has some new items in the store for December... YAY! I colored one of the penguins in the Penguin Trio set. Isn't she the cutest! The dies and sentiment to make this card are from Jaded Blossom. Barb from BugBites here wishing everyone a Happy Thanksgiving! I am spending the holiday weekend with family in northern MN. However, it feels more like mid- January vs Thanksgiving. The temps are well below zero today, Brrr! 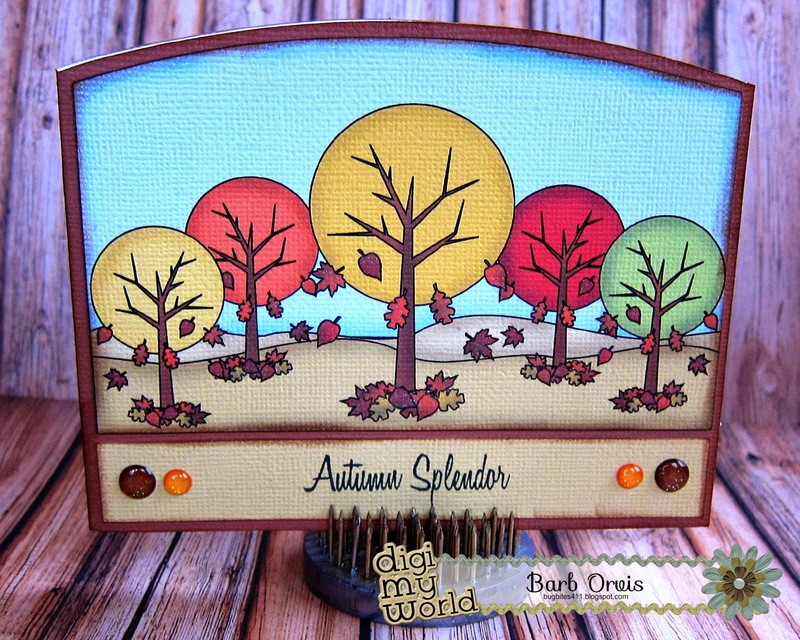 Digi My World Clipart called It's Fall. Just print, cut and add a sentiment. Doesn't get any faster than that. Again, many wishes for a warm and safe holiday weekend!!! Hi, it's Sandy here from, "A Little Piece Of Heaven"! Today I am here to share with you some of the new digis that just came out at the Digi My World Store! The Penguin Trio, and Polar Bear Ice Cap! The penguins actually come in a set of three, but I only needed two for this card! I just love when I can mix and match different images to create a scene! It's so much fun! There has been a hand full of new digis, so you will want to go and check it out! Hello everyone! 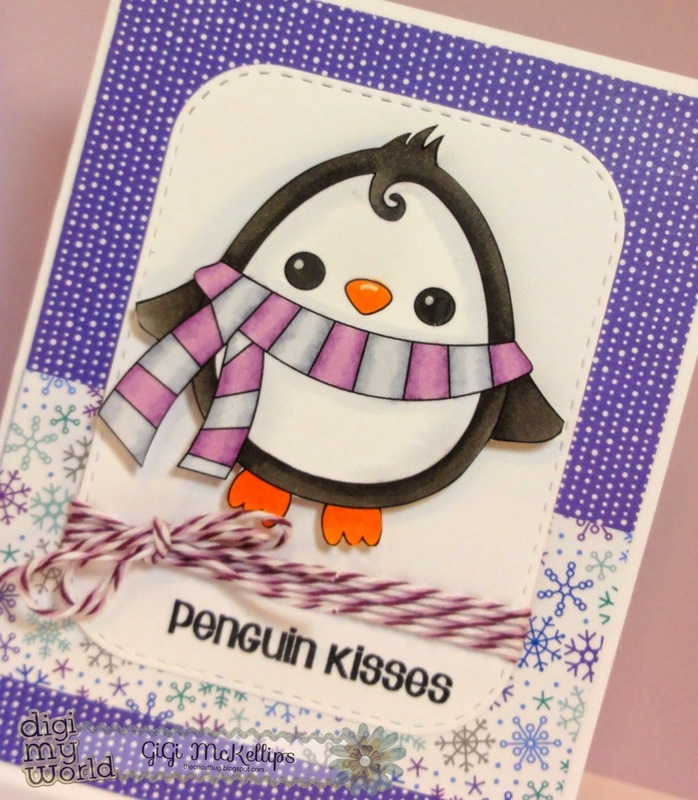 This is GiGi from The Cricut Bug and I am sharing this card using an image from the NEW Penguin Trio digital stamp set. I printed and colored the penguin with Copic markers from the Penguin Trio digital stamp set. I added him on top of a mat that I cut with the Jaded Blossom Layered Frame and Journal Die and I also wrapped some twine around the mat and tied a bow. 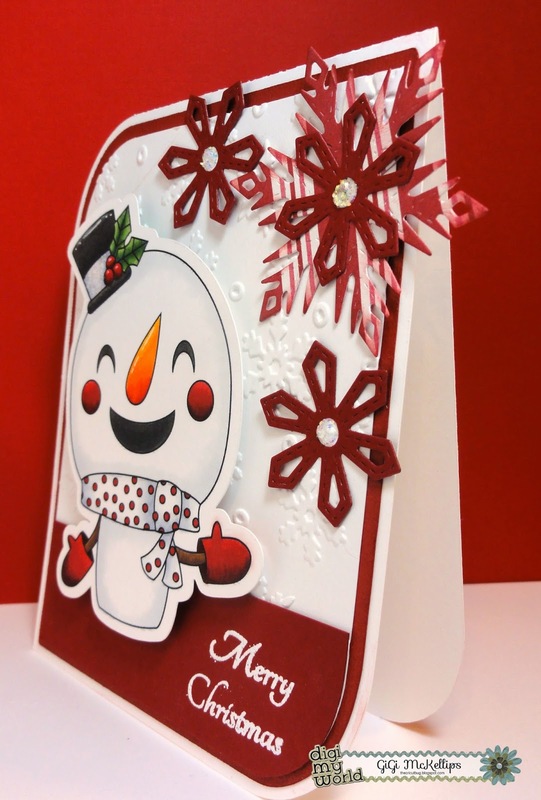 I stamped the sentiment with the Merry & Bright stamp set and added to the card base. We are having a digital design team call! We are looking to add individuals to our digital team. The term will be for 6 months that will run Jan - June 2015. Creative individuals who love to color digital stamps. Whether you enjoy making cards, layouts, 3d projects, etc..we want to see it all! A 6 month term, January - June 2015. Please put "Design Team Call" in your email subject and include your name and email address in the body of the message. Link(s) to your blog, facebook page, twitter, pinterest, and any other social media outlets you may belong to. A little about yourself and why you would like to be a part of our team! New Design Team members will be contacted via email and will be announced on the blog on or around December 8th. Larelyn here from Handmade From My Heart. Today I'm sharing Day 1 of the 12 Days of Christmas images that can be found HERE. I think this little partridge is so darn cute! I colored the image with Copic markers. The sentiment is from Jaded Blossom's Christmas Wishes and the die is from the Mini Tag Dies 2 set. I also added Doodlebug gold sprinkles, some burlap and sparkly rick rack. I hand cut the little pear and punched the leaf cluster. Thanks for stopping by today. Be sure to take a look at the entire 12 Days of Christmas set. And, you'll be happy to find some brand new images in the store as well. Hello Friends! Melissa from Doxie Mel Designs with a new project. I have a cute card to share with you made with one of the ducks in the Old MacDonald set. He is colored with Spectrum Noir markers and I added a sentiment from Jaded Blossom. 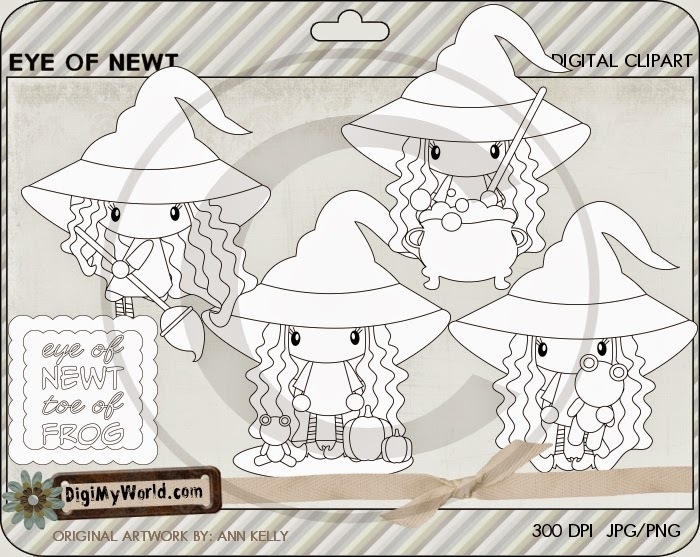 I hope you liked my card today, you can check out other digital stamps here at the Digi My World Store. Hi y'all, It's Sandy here from, A Little Piece Of Heaven! It's time to share another card with you! I am using, "Hayrides" from the Digi My World Store! I needed to make a Thanksgiving card to mail out to my sister, and thought these images from the Hayrides file went perfect for what I had in mind making! :) I love when that happens! Both the hay/corn, and the kids having a hayride came from the same file! I used Martha Stewart, Garden Trellis, Impression Obsession Dies DIE096-D, and JustRite, Give Thanks Nested Frames & Occasions for the finishing touches! Hello everyone! 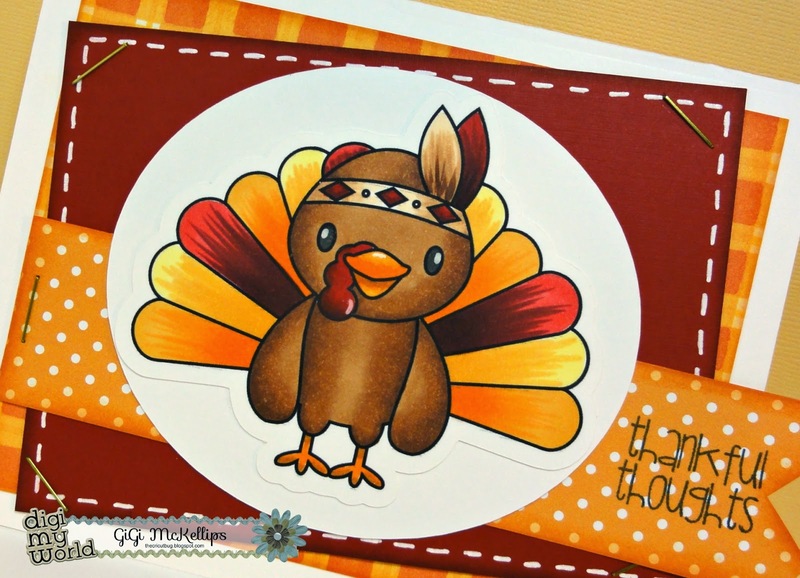 This is GiGi from The Cricut Bug and I am sharing this card using an image from the Turkey Time digital stamp set. I can't believe it's November already! Where has this year gone?!?! I printed and cut the turkey from the Turkey Time digital stamp file and colored him with Copic markers. I mounted him to an oval on top of layered mats. I did something different with this card and I really like it! I used staples in the corners and at the edge of the banner. Something different! I hand cut the banner and stamped the sentiment using the Jaded Blossom Lets Talk Turkey stamp set. Barb from BugBites here. Hope you all are enjoying the fall weather. Cookies always make a sweet treat to give anyone, even if it is just a couple chocolate chip cookies. So, I have put together a little treat using what I call a "hidden gem" digital file I discovered in the DMW store. Hidden deep within the Alphabet files, you will find a treasure full of cute images like my little chef girl I used on this treat tag I found among the Letter C digi set here. I added her with some foam tape to my tag. These print and cute files make putting treats like this together a snap. 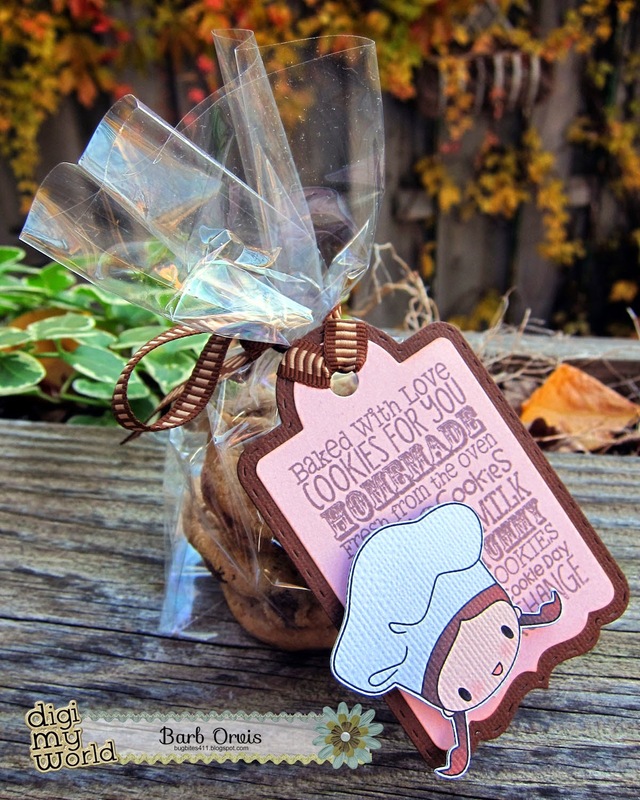 Even plain chocolate chip cookies can look like a store bought treat with just a little paper and a cute digital image from DMW! It's Larelyn from Handmade From My Heart. Today for my design team project I'm sharing one more image from the Apple Picking Time set. My Copic class gals are working on coloring fruit so I thought this would be a great image for them. I hand cut the flags and added Jaded Blossom's sign post from the Fall Dies set and stamped it with one of the Harvest Signs. A little ink here and there, a twine bow and that's it! Hello Everyone! 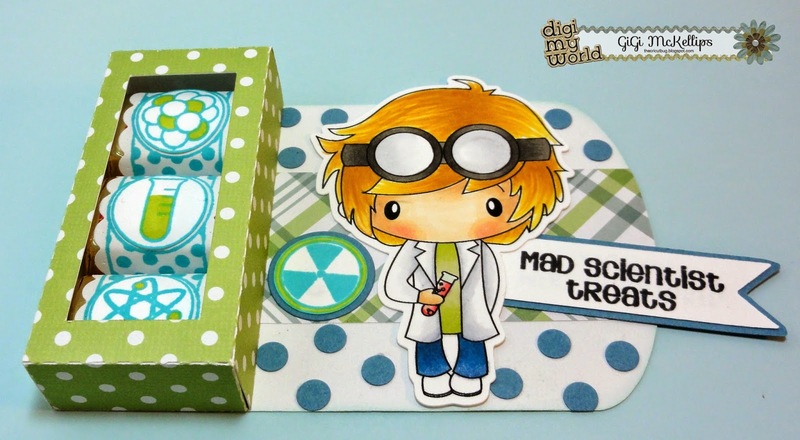 Melissa here with a new card for Digi My World. I am adding to my stash of cards with this sweet horse image. The horse is from the Old MacDonald set, and he is colored with Spectrum Noir Markers. Hi, it's Sandy here from "A Little Piece Of Heaven"! I just love this time of the year and being able to use fall colors! I am really loving this set of witches too! Here is what the entire set looks like! 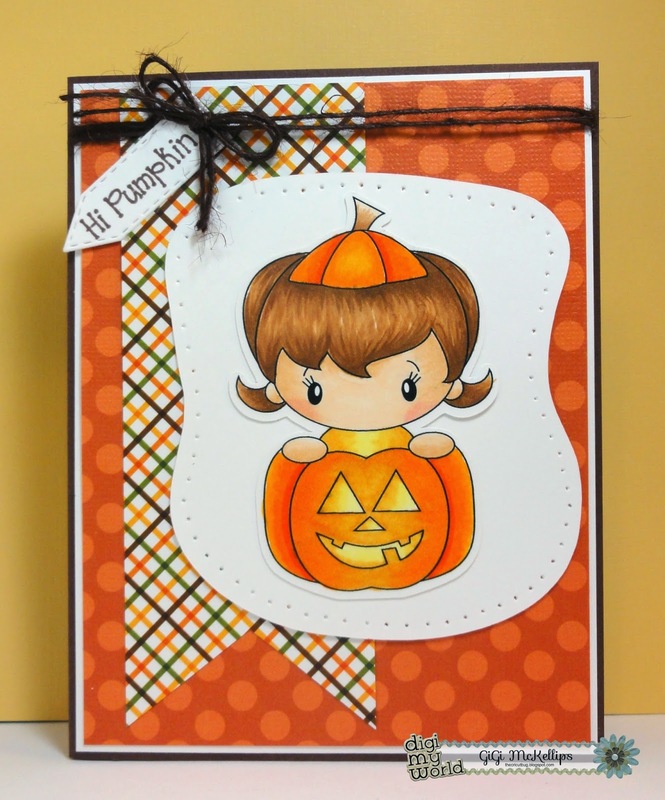 Here is the list of supplies I used to make this card! Hello everyone! This is GiGi from The Cricut Bug and I am sharing this project using an image from the Science Rocks digital stamp file. This is such a fun file! It's FILLED with some super cool images! I started this project by cutting the SVG Cutting Files Kawaii Sea Nugget Platform box. I turned it sideways before I decorated it for something a little different. I printed and cut out the Scientist in my Cameo program and colored him with Copic Markers. 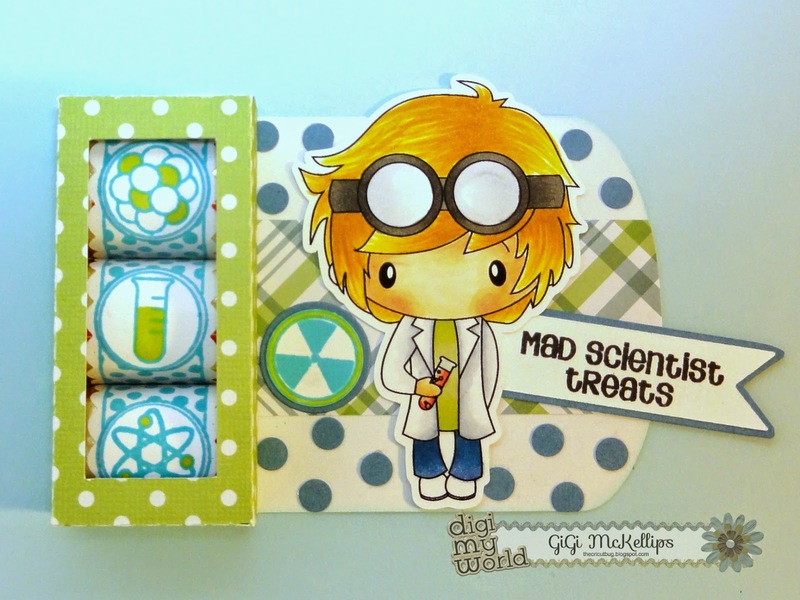 I added the nuclear sign and images on the candies using the Jaded Blossom Science Candies stamp set and the sentiment was stamped from the Science Matters set. 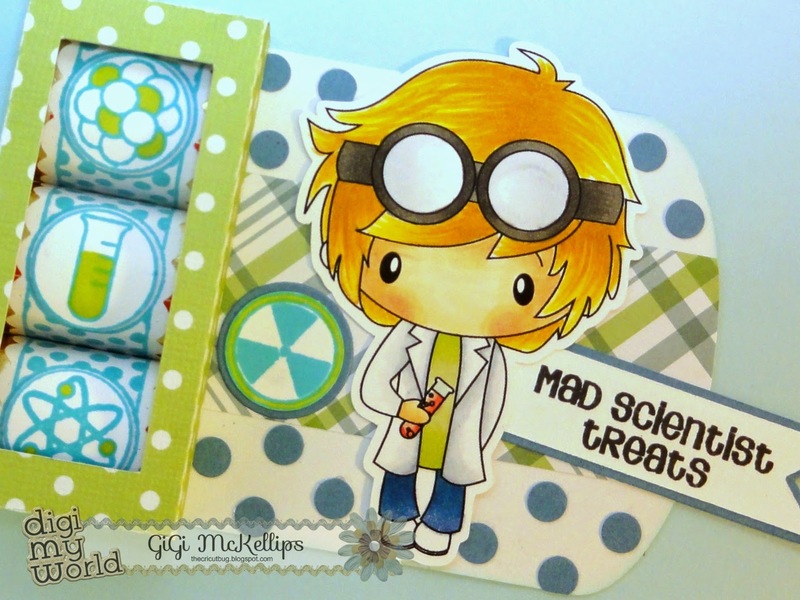 I also cut out the candy wrappers using the Candy Wrap Dies and stamped the pattern using the Candy Wrap stamps. It's Larelyn from Handmade From My Heart. I just love this time of year - wonderful colors, cool (but not cold) weather, and my favorite holidays just around the corner. Today I made a card using one of the images from the Garden Girl Penny set. I colored Penny with Copic markers and then added some pumpkins from Jaded Blossom's Fall Dies and a sentiment from Jaded Blossom's Let's Talk Turkey set. The bow is twine and Crafter's Spools with a Doodlebug Design sequin. Hello Everyone! Melissa here with a new card for you today- I found this sweet acorn at the store. You get the digital stamp and a printable acorn for a dollar. This acorn was printed and then cut with my Silhouette. He is colored with Spectrum Noir Markers. 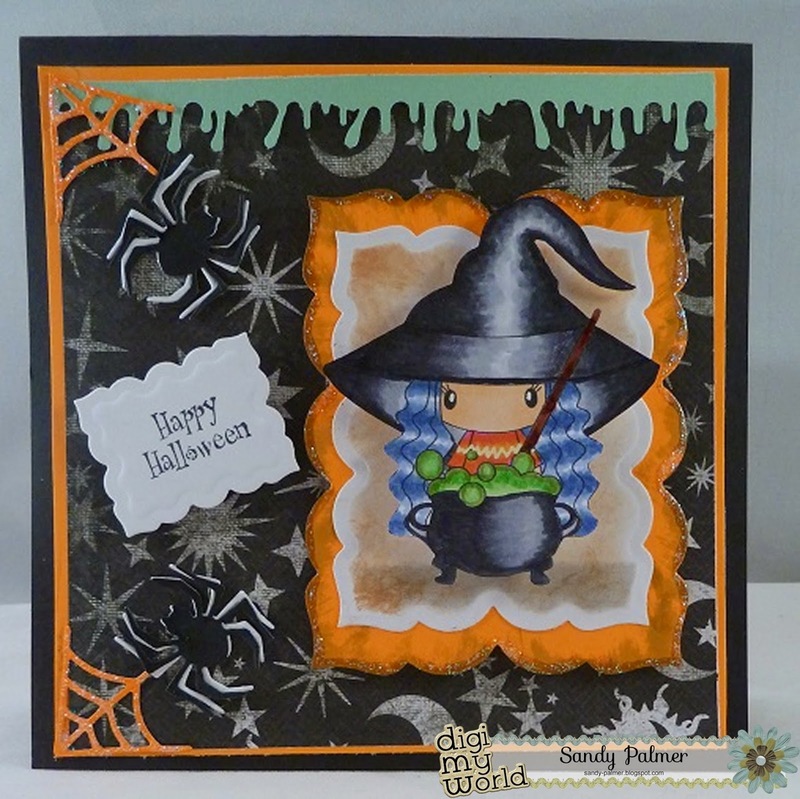 Today I would like to share with you a little card I made for Halloween!I used the delightful, "Wendy In Flight" digi from the Digi My World Store! I used Spellbinders, Labels One on the card base, and Decorative Labels Twenty Seven on the frame! 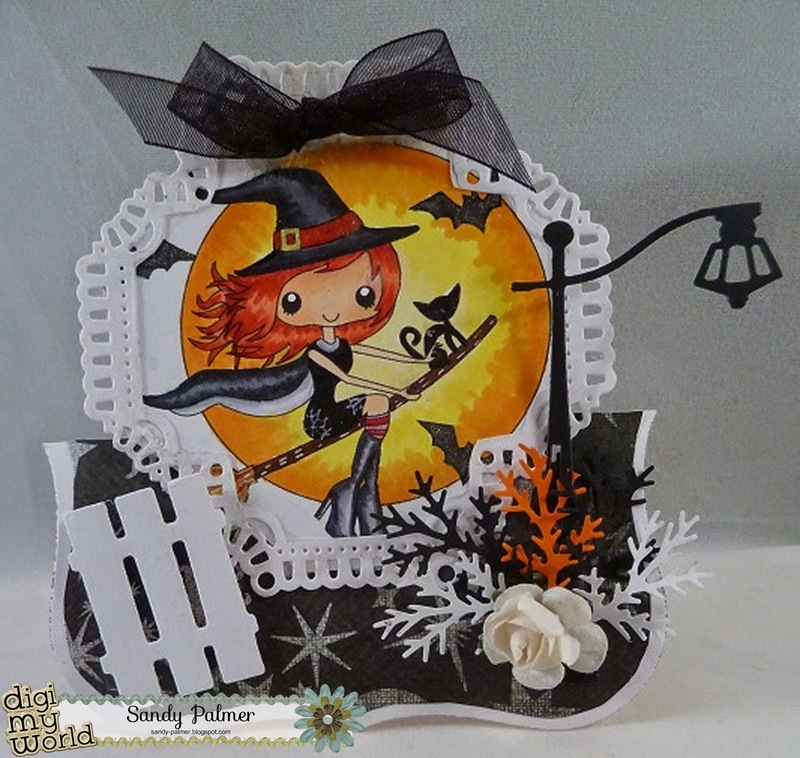 The paper is from DCWV, called, The Halloween & Fall Paper Stack! I used QuicKutz, Crate for the little fence! The Colonial Lamp Post is from Cheery Lynn! I added some Pine from my Martha Stewart Punch! I colored the image with my Copics! I did use a White Gel Pen, and my Stardust, Gelly Roll Pen! That's about it! I hope you enjoyed today's post! Hello everyone! 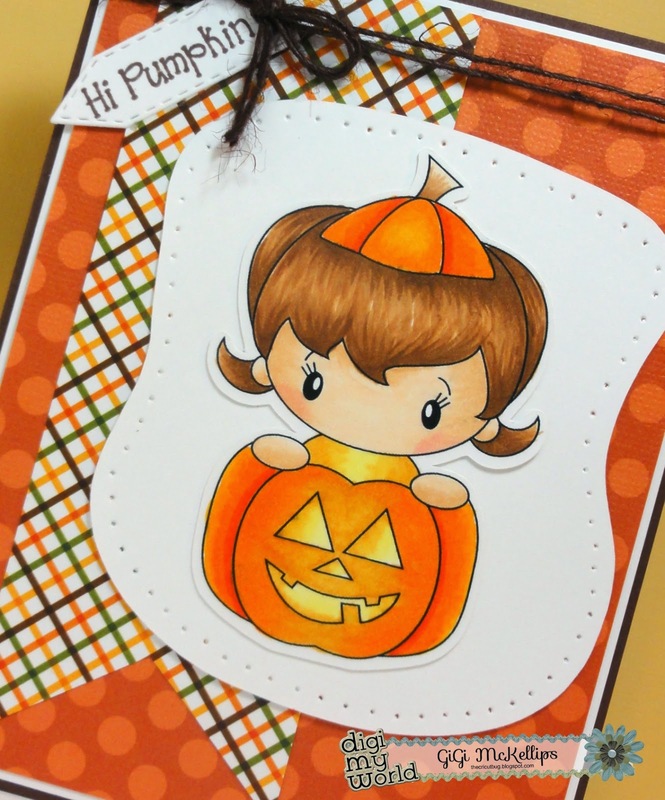 This is GiGi from The Cricut Bug and I am sharing this card using an image from the Pumpkin Patch Cutie digital stamp file. I printed and cut the girl from the Pumpkin Patch Cutie digital file and colored her with Copic markers. I added her to a mat that I pierced the edges of using a piercing tool. I cut the sentiment banner from the Jaded Blossom Mini Tag Dies and stamped the sentiment from the Lets Talk Turkey stamp set. ©2011 Digi My World. All Rights Reserved. Awesome Inc. theme. Powered by Blogger.